Aza Holmes is just trying to get through each day. She does typical things like going to school and hanging out with her best friend, Daisy, but everything is made more difficult by her anxiety induced thought spirals. When local billionaire Russell Pickett goes missing, the prospect of the $100,000 cash reward motivates Aza and Daisy to rekindle a childhood friendship with his son, Davis. However, any type of normal relationship is complicated by Aza’s thought spirals, and Davis’s situation is much more complicated than they originally realized. For anyone suffering from anxiety, or that knows someone who is, I can’t recommend this book enough. Overall, this book is about the characters, how Aza deals with her thought spirals, how all-consuming they can become, and how they affect her relationships. The plot, while secondary to Aza’s internal struggles, was enjoyable and a little quirky (I mean, that tuatara!). I would happily read this book again, but I made sure to return it immediately so that others can get the same enjoyment and enlightenment out of it. Highly recommended. This was such an engaging book. Following Aza through her process of coping with OCD was fascinating. The thing that I loved about this book was that the effects of the disorder weren't romanticized. It is something that got in the way developing relationships and caused some hurt to others without demonizing either side. So often there are the traditional stories where the theme is "it doesn't matter what you are going through we will work through it! ",which is a very romantic sentiment, but then never addresses the long lasting effects of something that you can't just wish away. Or it paints those around the main character as unloving and weak because they struggle dealing with the other persons struggle. 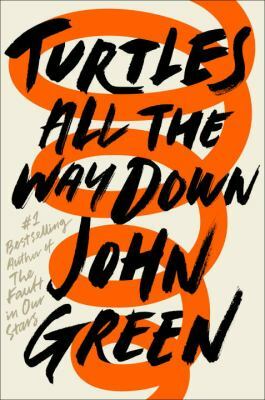 John Green wrote beautifully representing both sides of this story. It is also not neatly wrapped up in a bow in the end there was some closure, but John Green really leaves a lot of the ending between Aza and Davis to the readers imagination. Which normally I detest but the way he wrote it, it was absolutely fantastic.